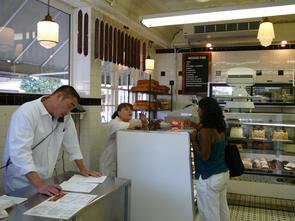 Female employee of Famous 4th Street Deli waiting on female customer at cake and pastry counter. Asian American employee talking on telephone. "Smoked Fish" menu board on wall.